RUGBY’S MOST famous and accomplished chef – Celebrity Masterchef winner Phil Vickery – put his reputation on the line for a good cause when he took part in Scrum Dine With Me, organised by Wooden Spoon. 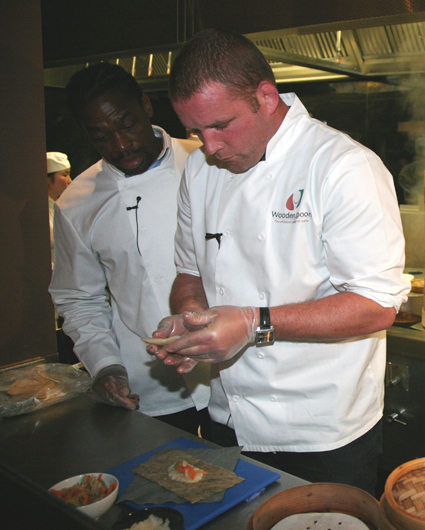 The former England captain pitted his cooking talents against ex-Scotland stand-off Craig Chalmers, former France flanker Serge Betsen and Perpignan-bound back-rower Luke Narraway, who played for England in 2008-09. 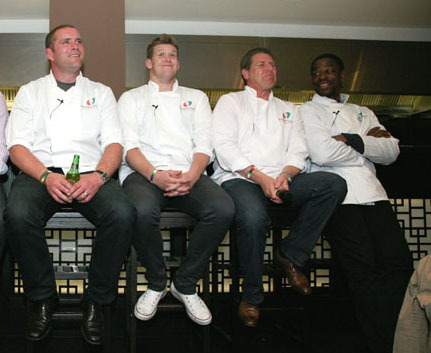 With the venue for the contest being Ping Pong dim sum restaurant in the City of London, the menu was oriental and, helped by the restaurant’s chef, the four rugby stars prepared a course each for around 150 guests and a panel of expert judges, including Masterchef presenter Gregg Wallace. All the diners voted for the winner and the pre-event favourite, Vickery, came out on top. Betsen was second, Chalmers third and Narraway fourth – but if truth be told, all the food was top notch and, most importantly of all, nearly £30k were raised for Wooden Spoon’s charity projects. Chalmers was first to put his cooking in the spotlight as he prepared the appetizer – a roast pork puff and a spring roll stuffed with satay chicken with pineapple. Wallace called it “stunning” and it was certainly my favourite dish of the evening. So, having provided a great evening of cheeky rugby banter, excellent food and plentiful wine, beer and cocktails, what’s next for Wooden Spoon? Some of their infamous Spoon Challenges are on the horizon and Vickery is swapping his chefs whites for some outdoor gear to take part in two of them this summer. First up for Vickery is the Four Peaks challenge, from 28-30 June. It is Spoon’s most popular team challenge event and sees teams of three, plus a support driver, take on Ben Nevis, Helvellyn, Snowdon and Carantouhill – all in under 48 hours. Two months later, on 7 September, Vickery will be guiding three other team members through what is arguably Spoon’s toughest challenge – The Ford Great Lakeland Challenge. The teams canoe England’s longest lake; cycle up the two steepest passes in England, Wrynose and Hardknott; and then conquer, on foot, England’s highest peak, Scaffell Pike – all in under 12 hours. Encouraging more people to take part is important to Vickery and he is keen to stress that you don’t have to be a World Cup winner to do it. “Hopefully I’ll inspire other people to do it – if I can do it then anyone can! After three back operations, two shoulder ops and a disc replacement in my neck, canoeing, cycling and running are not exactly the best for me. But I have to get my head down and get on with it. To join Vickery on these challenges, or to find out more information about them and other challenges, click here.